Hello all! 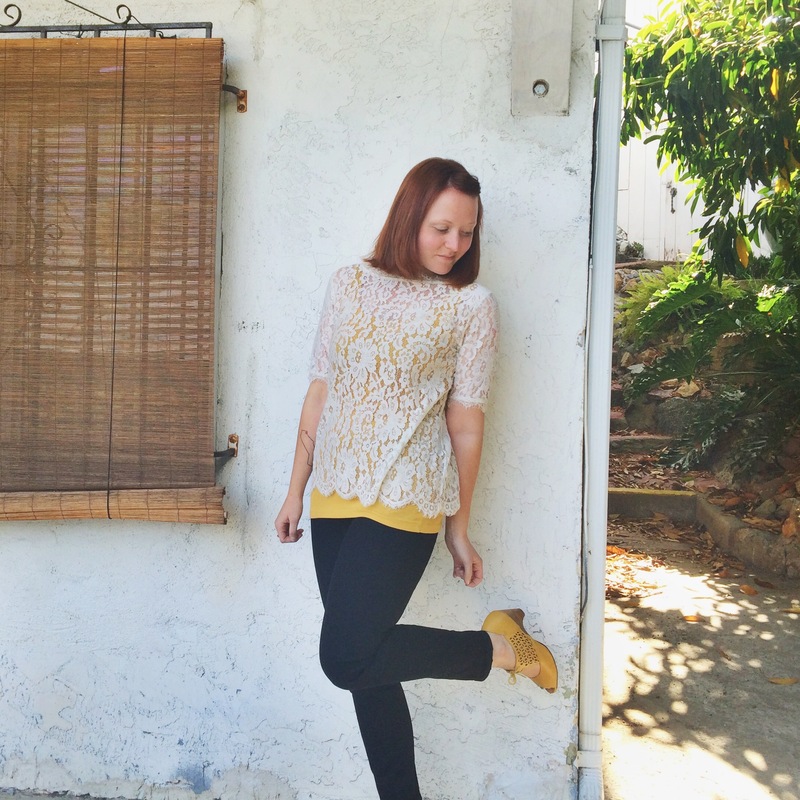 This is the first of my style posts – I’ve decided to call them “outfit breakdowns”. I’ll post a photo of my outfit, breakdown all of the pieces, explain why I love them, and link to them if I can in case you want to pick up something for yourself! I love personal fashion and style because it’s such a fun, accessible way to tell the world who you are. And the beauty of a wardrobe is that it evolves right along with you as you grow and change in life. During high school, I had a different style phase every single year. Even though they were just outfits, they helped me on the path to becoming comfortable in my own skin and being proud of who I am. Whether I was sporting bright blue tights and a Death Cab for Cutie t-shirt, or a floor-length gunne sax dress from the 70s, my clothes always helped me feel more at home in myself. Spring is here (my favorite season), and that means bright colors! Though, with my seemingly permanent pale skin and bright red hair, I like to keep some grounding colors in the palette of my outfits or else I just look like one big bright color explosion. Have you guys ever visited Pinup Girl Clothing? It’s absolutely amazing. Even if pinup style is not your thing, I guarantee you’ll fall in love with something on their site. I’ve gotten a few dresses from them before, and a blouse or two, but my favorite section on their site is shoes! A cute pair of heels goes with anything, regardless of the era, and their heels are to die for. Unfortunately, the bright yellow kitten heels you see me wearing in the photo were on final sale when I bought them and no longer seem to be available. I suggest following them on Instagram and waiting for a sale on the sale section… you’ll score big time. Can we talk about Madewell for a second? Madewell is an incredible clothing company that I somehow JUST discovered. I asked the clerk at San Diego’s location and she said the company has been around for years. Don’t know how that’s humanly possible since I about had a fit over everything in the whole dang store. My personal style gravitates toward simple, timeless pieces. I strive for effortless elegance… only seldom do I achieve that of course, but that’s life. We’re not perfect, and who would want to be? You know what is perfect? These black denim jeans. I had been searching for new black jeans for months when I wandered into Madewell a couple of weeks ago. When I slipped these on it was like the skies opened up and the denim angels sang a heavenly, fibrous tune. Okay, maybe I’m exaggerating just a little bit, but there is truly nothing more beneficial to one’s wardrobe than the discovery of a well-fitting, well-made item that can go with almost anything else in said wardrobe. If you’ve been in the market for some new stem coverings, I can’t recommend these highly enough. And that’s it for today! Sorry I could only link to one item, but the shoes and top were things I bought quite a while ago. If you liked the outfit, let me know in the comments! If you have any suggestions as to how to make these outfit breakdowns better or more interesting, I’m all ears. Until next time, happy dressing! LOVE THIS OUTFIT! Mustard yellow is the ONLY yellow I can wear against my Irish skin. Love your blog too, girl! Thanks for reading lady!! ❤ ❤ I know what you mean about the pale skin dilemma hahaha.